Stephen Douglas Kerr (born September 27, 1965) is an American professional basketball coach and former player who is the head coach of the Golden State Warriors of the National Basketball Association (NBA). He is an eight-time NBA champion, having won five titles as a player (three with the Chicago Bulls and two with the San Antonio Spurs) as well as three with the Warriors as a head coach. Kerr has the highest career three-point percentage (45.4%) in NBA history for any player with at least 250 three-pointers made. He also held the NBA record for highest three-point percentage in a season at 52.4% until the record was broken by Kyle Korver in 2010. On June 2, 2007, the Phoenix Suns named Kerr the team's president of basketball operations and general manager. Kerr helped managing partner Robert Sarver buy the Suns in 2004 and became one of Sarver's trusted basketball advisors. Kerr announced his retirement from the Suns in June 2010. Afterwards, Kerr returned as a color commentator for NBA on TNT until 2014, when he pursued a career in coaching. On May 14, 2014, the Golden State Warriors named Kerr the team's head coach. On April 4, 2015, with a win over the Dallas Mavericks, Kerr broke the NBA record for the most regular-season wins for a rookie coach. The Warriors went on to win the 2015 NBA Finals, making Kerr the first rookie coach to win a championship since Pat Riley in the 1982 NBA Finals. On April 13, 2016, the Warriors broke the record for the most wins in an NBA season, breaking a record previously held by Kerr's 1995–96 Chicago Bulls. The Warriors returned to the Finals for three straight years, losing in 2016 and winning again in 2017 and 2018. Kerr was born in Beirut, Lebanon to Malcolm H. Kerr, an American academic who specialized in the Middle East, and his wife, Ann (Zwicker). He has three siblings. His grandfather, Stanley Kerr, volunteered with the Near East Relief after the Armenian Genocide and rescued women and orphans in Aleppo and Marash before eventually settling in Beirut. Kerr spent much of his childhood in Lebanon and other Middle Eastern countries. He attended Cairo American College in Egypt, the American Community School in Beirut, Lebanon, and Palisades High School (now Palisades Charter High School) in Los Angeles. Malcolm Kerr was killed by members of the Shia Lebanese militia called Islamic Jihad on the morning of January 18, 1984 at the age of 52 while he was serving as president of the American University of Beirut. He was shot twice in the back of his head, by gunmen using suppressed handguns, in the hallway outside his office. Kerr was 18 years old at the time, and a college freshman; regarding his father's death, he has said: "Before my father was killed, my life was impenetrable. Bad things happened to other people." The Kerr family sued the Iranian government under the Antiterrorism and Effective Death Penalty Act of 1996. While warming up with the Arizona Wildcats for a game at arch-rival Arizona State in 1988, Kerr had to deal with many ASU Sun Devil fans in the crowd chanting "PLO" and "your father's history." Though tearful, Kerr led the Wildcats to victory, scoring 20 points in the first half, making all six of his three-point attempts. The athletic director of Arizona State, Charles Harris, sent a letter of apology to Kerr a few days later. Kerr graduated from the University of Arizona in 1988 with a Bachelor of General Studies, with emphasis on history, sociology and English. Minimally recruited out of high school, Kerr played basketball for the University of Arizona from 1983 to 1988. 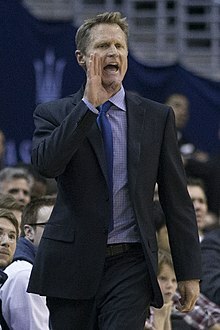 In the summer of 1986, Kerr was named to the USA Basketball team that competed in the FIBA World Championship in Spain. The team was the last American Men's Senior Team composed strictly of amateur players to capture a gold medal. He blew out his knee in the tournament, usually a career-ending injury, forcing him to miss an entire season (1986–87) at Arizona. After returning to the team, Kerr became a fan favorite due to his leadership, his ability to triumph in adversity, and long-range shooting. Virtually every time he got the ball, the Arizona fans would chant "STEEEVE KERRRR." It became a rallying cry. He helped the Wildcats reach the Final Four of the NCAA Division I basketball tournament in 1988 along with fellow All-American teammate Sean Elliott. Kerr also set an NCAA record for 3-point percentage in a season (114–199, 57.3%). Kerr was selected by the Phoenix Suns in the second round of the 1988 NBA draft. He was traded to the Cleveland Cavaliers in 1989. He spent over three seasons (1989–1992) there and then part of the 1992–93 season with the Orlando Magic. In 1993, he signed with the Chicago Bulls. The Bulls made the playoffs in the 1993–94 and 1994–95 seasons, but without Michael Jordan's presence for all of 1994 and much of 1995, the team could not advance to the Finals. However, with Jordan back full-time for the 1995–96 season, the Bulls set a then NBA-record of 72–10 and defeated the Seattle SuperSonics in the 1996 NBA Finals. Kerr played a major part of the Bulls' championship victory in the 1997 NBA Finals against the Utah Jazz. In the final seconds of Game 6 with the score tied at 86, he took a pass from Jordan and hit the title-winner. The Bulls won, earning the franchise's fifth title. Kerr also won the 3-Point Shootout at the 1997 All-Star Game. In the last minute of Game 2 of the 1998 NBA Finals against Utah, Kerr missed a 3-pointer, grabbed his own rebound and made a pass to Jordan who made a crucial three-point play, putting them in the lead for good. The play helped Chicago win the game and tie the series at 1. The Bulls won the series in 6 games. In January 1999, Kerr was acquired by the San Antonio Spurs in a sign-and-trade deal with the Bulls, whereby Chuck Person and a first-round pick in the 2000 NBA draft was sent to Chicago. The Spurs reached 1999 NBA Finals and won their first NBA Championship with a 4–1 series victory over the New York Knicks. Kerr became one of two players to win four straight NBA titles without being a part of the 1960s Boston Celtics dynasty—the other being Frank Saul, who won four straight with Rochester and Minneapolis from 1951–54. Kerr and Saul are also the only two players in NBA history to have won two championships with two different teams in consecutive seasons. Kerr was traded to the Portland Trail Blazers alongside Derek Anderson on July 24, 2001 in a deal that brought Steve Smith to the Spurs. He would remain in Portland for the 2001–02 season, playing in 65 games. After his brief stint in Portland, he was traded back to San Antonio, along with Erick Barkley and a 2003 2nd-round pick, in exchange for Charles Smith, Amal McCaskill, and Antonio Daniels on August 2, 2002. He supported the Spurs from the bench in nearly every game (75) the following year, in what would be his final season in the league. In Game 6 of the 2003 Western Conference Finals against the Dallas Mavericks, Kerr made four second-half three-pointers that helped eliminate Dallas. The Spurs eventually won the NBA championship by beating the New Jersey Nets in the 2003 NBA Finals, 4–2. Kerr announced his retirement after the 2003 NBA Finals. He played 910 regular-season games but started only 30 of them, 20 of those games coming in the 1991–92 season. His career totals are: 5,437 points (6 ppg), 1,060 rebounds (1.2 rpg), and 1,658 assists (1.8 apg). He also retired as the league's all-time leader in three-point shooting percentage for a season (.524 in 1994–95) and career (.454). In 2003, Kerr became a broadcast analyst for Turner Network Television (TNT), offering commentary alongside renowned analyst Marv Albert. During his tenure, he performed a segment sponsored by Coors Light called Steve's Refreshing Thoughts in which he brought up interesting facts in NBA history. This segment continued through sponsorship, and became known as Steve Wonders, sponsored by Sprint. In the same time period, Kerr also contributed to Yahoo! as an NBA commentator. He has provided his voice for the in-game commentary of EA Sports video games NBA Live 06, NBA Live 07, NBA Live 08, NBA Live 09 and NBA Live 10 with Albert. He has also provided his voice as a color analyst for NBA 2K12, NBA 2K13, NBA 2K14 and NBA 2K15. He remains a commentator in NBA 2K15 despite becoming the Golden State Warriors coach for the 2014–15 season several months prior to the game's release. 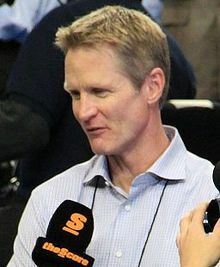 Kerr left broadcasting in 2007 to work as a general manager for the Phoenix Suns, but it was confirmed on June 28, 2010 that he would return as an NBA analyst for TNT starting with the 2010–11 NBA season. Since 2011, Kerr has also called the NCAA Men's Division I Basketball Championship on Turner Sports and CBS, teaming up with lead broadcasters Jim Nantz and Clark Kellogg for the First Four and Final Four games, and with Albert in other rounds. Kerr was a regular contributor to the website Grantland from 2011 until it closed in 2015. On April 15, 2004, Kerr was announced as a member of a potential group of buyers that would acquire his old team, the Suns, from Jerry Colangelo for $300 million. He became part of Suns management, acting as a consultant. During the 2006 NBA All-Star Weekend, he was a member of the San Antonio team that won the Shooting Stars Competition. On June 2, 2007, Kerr announced his departure from his broadcasting position at TNT and his commentating position at Yahoo! to assume duties as the general manager of the Phoenix Suns beginning with the 2007–2008 season. On February 6, 2008, reports surfaced that Kerr was planning to trade Suns forward Shawn Marion and guard Marcus Banks to the Miami Heat in exchange for Shaquille O'Neal, which he did. The Suns were eliminated by the San Antonio Spurs in five games in the first round of the playoffs. On December 10, 2008, Kerr continued to remake the Suns roster by trading away Boris Diaw, Raja Bell, and Sean Singletary to the Charlotte Bobcats in exchange for Jason Richardson, Jared Dudley, and the Bobcats' 2010 second-round draft pick, which was used to draft Gani Lawal of Georgia Tech. On June 25, 2009, Kerr traded O'Neal to the Cleveland Cavaliers for Ben Wallace, Sasha Pavlovic, a future second-round draft pick and cash. On May 5, 2010, the Suns wore Los Suns jerseys in Game 2 against the Spurs to be united against the controversial Arizona immigration law. Kerr himself compared the law to Nazi Germany. On June 15, 2010, Kerr stepped down as president and general manager of the Suns, but still owned a 1% share of the Suns' organization that he kept until 2014. On May 14, 2014, Kerr reached an agreement to become the head coach for the Golden State Warriors, succeeding Mark Jackson. Kerr coached in the 2014 Summer League for the Warriors. During the 2014–15 season, the team's offense employed elements of the triangle offense from his playing days in Chicago under Phil Jackson, the spacing and pace of Gregg Popovich in San Antonio, and the uptempo principles Mike D'Antoni and later Alvin Gentry used in Phoenix when Kerr was the GM. After the Warriors beat the Houston Rockets to win their 14th consecutive game, Kerr became the first coach to start his career with a 19–2 record. This beat out Al Cervi and his 18–2 start with the Syracuse Nationals. On December 10, 2014, Kerr became the first NBA rookie head coach to win 21 of his first 23 games. He was named the head coach of the Western Conference team for the 2015 NBA All-Star Game after Golden State had the best record in the conference. On April 4, the Warriors beat the Dallas Mavericks 123–110 to clinch home-court advantage throughout the playoffs, and Kerr got his 63rd win of the season to become the highest winning rookie head coach in NBA history, passing Tom Thibodeau and his 62 wins with the Chicago Bulls in the 2010–11 season. In the NBA Coach of the Year voting, Kerr was runner-up to Mike Budenholzer. The Warriors ultimately finished with one of the best regular seasons in NBA history, and the greatest in the team's 69-year history. Golden State ended with an overall record of 67–15, becoming the 10th team to win 67 or more games in a single season. It was the first time the Warriors had ever won as many as 60 games in a season; their previous high was 59 in the 1975–76 season. The Warriors also ended with a 39–2 home record, which is tied for the second best home record in NBA history. The Warriors were first in defensive efficiency for the season and second in offensive efficiency, barely missing the mark that the Julius Erving–led Sixers achieved by being first in both offensive and defensive efficiency. They became the first team in NBA history to have two win streaks over 15 at home (18 and 19). In the opening round of the playoffs against the New Orleans Pelicans, Kerr led the Warriors to their first four-game playoff sweep since the 1975 NBA Finals. Afterwards, the team surpassed the Memphis Grizzlies (4–2, in the second round). Down 2–1 in the series, Kerr made an unconventional adjustment in Game 4 to leave the Grizzlies' Tony Allen open and have his defender, center Andrew Bogut, guard the interior. His strategy was lauded after Allen, Memphis' best wing defender, was benched and limited to 16 minutes after missing wide open shots. The Warriors then defeated the Houston Rockets (4–1, in the Western Conference Finals), making the NBA Finals for the first time in 40 years. The Warriors faced the Cleveland Cavaliers in the Finals. Kerr and rival coach David Blatt were both in their first season as NBA head coaches, and this was the first time a pair of rookie head coaches faced each other in the NBA Finals since the NBA's first year of existence, in 1947 with Eddie Gottlieb of the Philadelphia Warriors and Harold Olsen of the Chicago Stags competing. After the Warriors went down 2–1 to Cleveland, Kerr started swingman Andre Iguodala in place of Bogut, jump-starting their stagnant offense for a 103–82 road win that evened the series. It was Iguodala's first start of the season, and the small unit came to be known as the Death Lineup. After the game, Kerr admitted to lying to the press in response to pregame questions about potential changes to his starting lineup. The Warriors went on to win the championship in six games, defeating the Cavaliers, 4–2, in the series, to give Kerr his sixth championship and first as a head coach. After the first two days of the defending champion Warriors' training camp, Kerr took an indefinite leave of absence to rehabilitate his back, which had caused problems since the 2015 NBA Finals. Around this time, assistant coach Luke Walton assumed Kerr's coaching duties. Kerr missed all of 2015 and most of January 2016, although technically the NBA credited Walton's win-loss record to Kerr. Kerr said "I think it's ridiculous", when asked about getting all of Walton's wins. On January 22, 2016, Kerr returned to coaching after missing 43 games, but warned he might need to miss games occasionally if there was a recurrence of the headaches and pain related to the spinal fluid leak that sidelined him. The Warriors went 39–4 with interim coach Luke Walton. The Warriors went 34-5 after Kerr returned to coaching. Golden State broke the 1995–96 Chicago Bulls 72–10 record by winning 73 games. Kerr became the first person in NBA history to be a part of 70-win teams as a player and head coach. He was named 2015–16 NBA Coach of the Year. Kerr would lead the Warriors to the 2016 NBA Finals where they would again face the Cleveland Cavaliers. The Warriors lost in seven games. On November 20, 2016, the NBA announced that Kerr had been fined $25,000 for public criticism of officiating during a radio interview with KNBR 680 on November 17. Kerr missed time during the 2017 playoffs due to recurring back issues. Associate head coach Mike Brown has acted as acting head coach during periods of Kerr's absence, and Brown continued head coaching into the playoffs leading the Warriors to a 12–0 record in the postseason. Kerr returned for the 2017 NBA Finals where he led the Warriors to victory over the Cleveland Cavaliers in five games. The Warriors finished the playoffs with a 16–1 record, the best postseason winning percentage in NBA history. Kerr is the fourth coach in NBA history to win two championships in his first three seasons of coaching. Kerr won his third championship as a head coach when the Warriors defeated the Cleveland Cavaliers in the 2018 NBA Finals in four games to give Kerr his eighth championship of his career. Kerr is third on the Warriors' all-time wins list behind Don Nelson and Eddie Gottlieb, and only Nelson has won more games in the West Coast portion of Warriors history. He married Margot Kerr, his college sweetheart, in 1990. They have three children: Nick, Maddy and Matthew. Since the conclusion of the 2016 U.S. presidential election, Kerr has been critical of Donald Trump and his election victory. In an interview following the election, Kerr voiced the opinion that Trump's rise to power was based on insults against women and minorities. He compared Trump's campaign performances and the crude responses of his supporters to The Jerry Springer Show. Although he expressed hope that Trump would be a good president, he made clear his "disgust" with Trump's disrespectful public discourse and his disappointment with the election results. Kerr has been a strong supporter of gun control, expressing disappointment with the government’s response to school shootings. ^ a b "A Separate Peace". tribunedigital-chicagotribune. ^ a b "Despite pain of dad's murder, Kerr became a champion – New York Post". New York Post. ^ "The Inside Story Of Steve Kerr And His Family's Little-Known History Of Altruism In The Middle East". UPROXX. May 25, 2016. Retrieved June 3, 2016. ^ a b "Steve Kerr and David Blatt Reached N.B.A. Finals on Unconventional Paths". The New York Times. June 5, 2015. Retrieved April 14, 2016. ^ a b Los Angeles Times (June 1, 2015). "Bill Dwyre: Steve Kerr is defined as a person by much more than basketball". latimes.com. ^ a b "The assassination of Steve Kerr's father and the unlikely story of a champion – For The Win". For The Win. ^ a b "Warriors coach Steve Kerr guided by his father's life and lessons". mercurynews.com. ^ "NBA Finals' Rookie Coaches: Golden State Warriors' Steve Kerr and Cleveland Cavaliers' David Blatt". ABC News. ^ "Steve Kerr and David Blatt Reached N.B.A. Finals on Unconventional Paths". nytimes.com. ^ a b "Golden State Warriors' Steve Kerr is tough enough for NBA coaching". ESPN. ^ Dodds, Tracy (March 1, 1988). "Arizona St. Apologizes to Kerr: Arizona Guard Was Target of Taunts by Fans Before Game". Los Angeles Times. Retrieved July 19, 2016. ^ "Arizona Daily Wildcat – Steve Kerr ready for grad speech, tortillas". arizona.edu. May 12, 2004. Archived from the original on September 15, 2006. ^ "Steve Kerr Player Profile". RealGM.com. Retrieved November 19, 2017. ^ Hudson, Jr., David L. (February 2007). Basketball Championships' Most Wanted. Potomac Books, Inc. p. 41. ISBN 1-59797-014-X. ^ "Steve Kerr career highlights". mercurynews.com. May 14, 2014. Retrieved November 19, 2017. ^ basketball.realgm.com, accessed May 16, 2015. ^ "Suns land Richardson from 'Cats". December 10, 2008. Archived from the original on December 11, 2008. ^ Coro, Paul (May 4, 2010). "Phoenix to wear 'Los Suns' jerseys for Game 2 vs. Spurs". The Arizona Republic. Retrieved May 2, 2017. It's hard to imagine in this country that we have to produce papers," Kerr said. "It rings up images of Nazi Germany. We understand that the intentions of the law are not for that to happen, but you have to be very, very careful. . . . It's important that everyone in our state and nation understands this is an issue that needs to be explored. So, we're trying to expose it. ^ "Warriors Reach Agreement in Principle for Steve Kerr to Become Team's Head Coach – THE OFFICIAL SITE OF THE GOLDEN STATE WARRIORS". nba.com. ^ "Steve Kerr accepts Golden State Warriors' coaching position". ESPN.com. ^ "Warriors' Steve Kerr off to best start in history for first-year coach". December 11, 2014. Retrieved June 13, 2017. ^ "Rockets at Warriors". NBA.com. ^ "Steve Kerr to coach West All-Stars". www.espn.com. ESPN. Retrieved February 16, 2015. ^ Kawakami, Tim (May 16, 2015). "The playoff evolution of Steve Kerr, in real time, through the ups, downs, struggles and eventual triumph in this series". San Jose Mercury News. Archived from the original on May 28, 2015. ^ Scott, Nate (May 12, 2015). "The Warriors' crazy defensive adjustment won them Game 4". USA Today. Archived from the original on May 28, 2015. ^ "Steve Kerr and David Blatt meet again, this time as rookie coaches in the NBA Finals – ProBasketballTalk". nbcsports.com. ^ Deveney, Steve (June 12, 2015). "Steve Kerr lied, and the Warriors took advantage in Game 4". Sporting News. Archived from the original on June 13, 2015. ^ "Warriors Head Coach Steve Kerr to Take a Leave of Absence to Focus on Back Rehab". NBA.com. October 1, 2015. Retrieved October 1, 2015. ^ "NBA reportedly considers crediting Luke Walton with Warriors' wins". Sporting News. Retrieved December 1, 2015. ^ "Luke Walton, the Warriors' winless wonder". ESPN. ^ Shelburne, Ramona (February 10, 2016). "Kerr battles lingering spinal-fluid issues, but coaches through pain". ESPN.com. Archived from the original on February 11, 2016. ^ Amick, Sam (April 14, 2016). "Warriors notch NBA-record 73rd win to surpass 1995-96 Bulls". USA Today. Retrieved April 14, 2016. ^ "Warriors' Kerr named 2015-16 NBA Coach of the Year". NBA.com. April 26, 2016. Retrieved April 26, 2016. ^ "Kerr fined $25K for publicly criticizing officials". ESPN.com. Retrieved November 20, 2016. ^ Boren, Cindy (May 7, 2017). "Steve Kerr had procedure to repair spinal cord leak, Warriors owner says". Washington Post. Retrieved May 10, 2018. ^ "Warriors (16-1) Record Best Postseason Winning Percentage in NBA History". Bleacher Report. June 14, 2017. Retrieved May 10, 2018. ^ "Steve Kerr's wife Margot Kerr - PlayerWives.com". May 15, 2014. Retrieved June 13, 2017. ^ Tsuji, Alysha (November 9, 2016). "Steve Kerr goes on pregame rant about presidential election: 'I thought we were better than this'". USA Today. Retrieved August 4, 2017. ^ Johnson, Thomas (February 15, 2018). "'Children are being shot to death day after day': Steve Kerr criticizes government's response". Washington Post. Retrieved August 6, 2018. ^ a b c Steve Kerr, basketball-reference.com, accessed March 20, 2010. 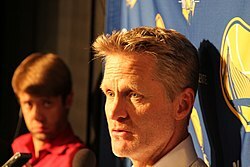 Wikimedia Commons has media related to Steve Kerr.